Due to the water crisis, the residents of Flint, Michigan do not trust the water coming out of their taps. This has led to major hygiene issues, as some residents refuse to use tap water for bathing or brushing their teeth. Of particularly concern is the use of antibacterial hand gels and baby wipes in the place of handwashing and bathing, which has led to a shigellosis outbreak. While the pipes leaching lead and other hazards into the water have not all been replaced yet, scientists say that simply placing a specific filter onto the head of the tap is enough to ensure the water safe for use. Problem solved, right? Not quite. After government officials disregarded residents’ concerns when the crisis began, why would Flint residents believe their water is safe now? Mere claims of fact are insufficient after such gross neglect for the well-being of this community. 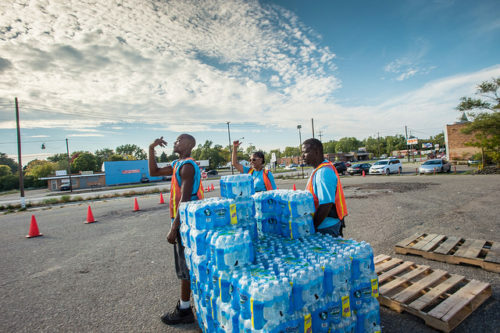 Further, Flint is dealing with systemic issues that are far-reaching and long-lasting. Enter Maya Shankar and the White House Social and Behavioral Sciences Team. Shankar and her team study how we can use what we know about information processing to influence public policy in ways that benefit society. (For instance, switching from telling veterans they were “eligible for education benefits” to informing them that they had “earned education benefits” led to an increase in enrollment.) Shankar and her team came to Flint to determine whether there are any challenges that can be solved with a behavioral science mindset. What they found was that the immediate issues stemming from the water crisis—those with short-term effects—could be solved through behavioral science techniques. Using a tool called “implementation prompts,” she hopes to encourage families who haven’t already done so to purchase water filters. After church services, the team could offer forms that ask families to indicate when, where, and how they planned on changing their filters. Shankar says, “Sometimes we just need a simple reminder to act on the things we want to act on.” Another example of behavioral tools is “social norming” to encourage washing hands and proper hygiene. These kids are internalizing the messages about how the lead is affecting them. If there is a direct correlation between lead exposure and the cognitive ability to handle stressful situations in a reasonable way, and we see more violent trends, can you imagine the pipeline of youth who are going to be going into the corrections system? Sheela Nimishakavi is a nonprofit finance and operations professional with a passion for creating socially just and inclusive communities. She has held senior management positions at several community based organizations addressing access to healthcare and services for persons with disabilities, currently serving as the Director of Operations of the Brain Injury Association of Virginia. After working in the nonprofit field for over a decade and seeing many organizations struggle with the administrative requirements of running a nonprofit, Sheela founded ThirdSuite, a consulting firm that offers nonprofit administrative services and trainings to help organizations increase their capacity and further their mission. Sheela received an MA/MPH in Health Policy and Management from Boston University School of Public Health, and a BS in Neurobiology, Physiology and Behavior from the University of California, Davis. She currently serves on the boards of the Central Virginia Grant Professionals Association and Empowering People for Inclusive Communities. Nonprofit leaders understand that organizational viability often depends upon a complex combination of internal and external factors. When the fit can no longer be made, the end may be near.